2018 - a particularly fine vintage?! Brits love talking about the weather so unsurprisingly the most frequent questions on our tours at the moment are ‘do you need to water the vines’ and ‘what impact will this extraordinary weather have on your 2018 vintage’? As you can see from our photos our vines are luscious, green and very happy indeed! Vines love hot weather and while it has been hot for England, most vines are used to growing in hotter temperatures than we've had! They have extremely effective root systems, capable of growing over 20 feet, so even in this unusually hot summer, finding water is not a problem. 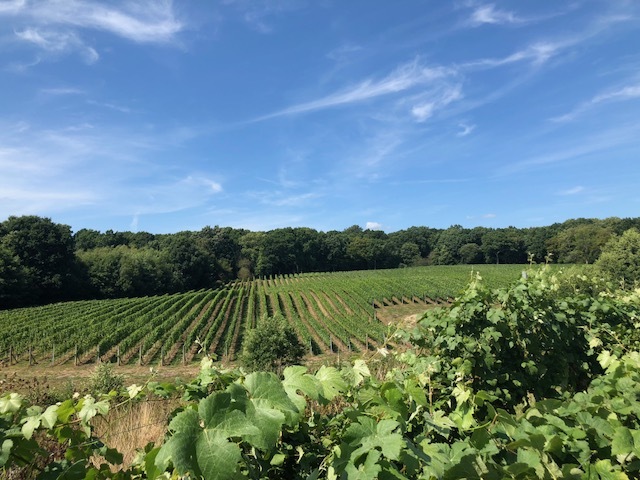 Much of Bluebell Vineyard is on clay unlike the chalky soil of much of southern England so only a couple of feet under the surface you can find rich, damp soil. This is the hottest, driest start to a season I can remember. At Bluebell we haven't had any significant rain since mid-April and that is unheard of for grape growing in England. In terms of growth and ripening we are easily two weeks ahead of where we would normally be and we're already seeing 'veraisin' on some of our pinot noir and pinot meunier grapes. We had perfect conditions for budburst, flowering and fruit set meaning there are now lots of bunches of grapes on the vine, and if this weather continues there is the potential to harvest grapes at full ripeness which will also mean excellent quality. The grapes have swelled nicely and we are expecting the flavours to be more concentrated with potentially a very exciting level of quality. Sugar levels and acidity don't rise and fall respectively in alignment so from the end of August we'll be berry testing frequently and expecting to harvest early. We have happily been free of downy and powdery mildew so far this season, but with the cooler and wetter weather predicted over the next few days we'll be checking carefully for botrytis. Our sites at Bluebell are on varying soils of soft clay, clay and sandy loam, and sandstone as well as different aspects, so these all have impact on drainage and the resulting canopy and fruit growth. We’ve chosen not to irrigate our newly planted young vines as we want them to learn to ‘search’ for the water and develop their strong root systems. If we make it too easy for them to find water now, they will struggle in future hot years when they mature and start producing fruit. So to recap, the vines are absolutely thriving in this weather. As always in the UK wine industry anything can happen but there's certainly speculation that 2018 could be a year of exceptional yield and quality. If only we didn’t have to wait several more years to taste the results!